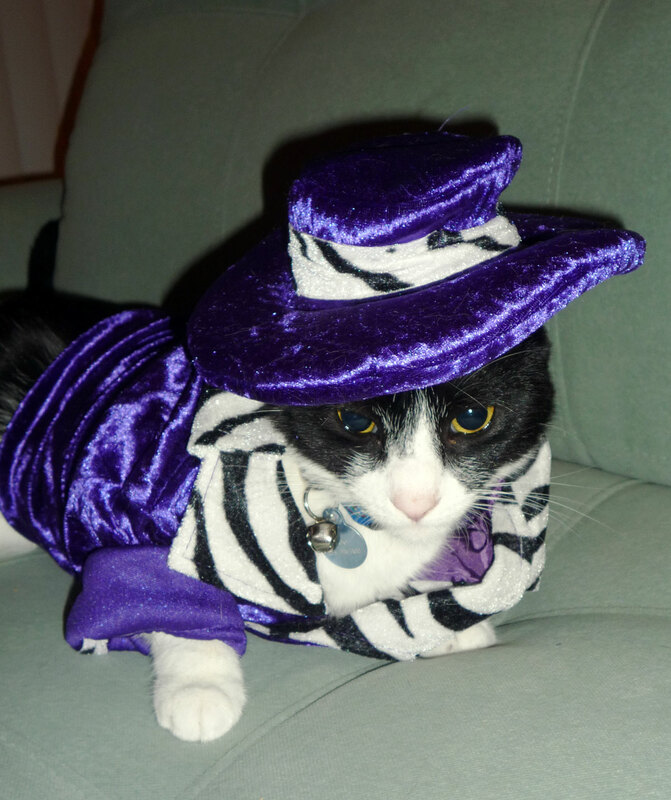 Your Daily Cute: Two Cats Tuesday: Our Halloween Costumes! Feel-Good Friday: Rescuing Baby Duckies! Two Cats Tuesday: Our Halloween Costumes! Happy Two Cats Tuesday, Cuteheads! Today is fun... Pimp and Moo dressed up in their Halloween costumes! A while ago, we had a vote on what they should be this year. The voting was close, but after a lot of thought (this is an important decision! ), we decided that Pimp would be Moo and Moo would be Pimp. Yup, Pimp dressed up as a cow (cat). And Moo dressed up as a pimp. So funny! I have spots! And udders... Moo doesn't have those. 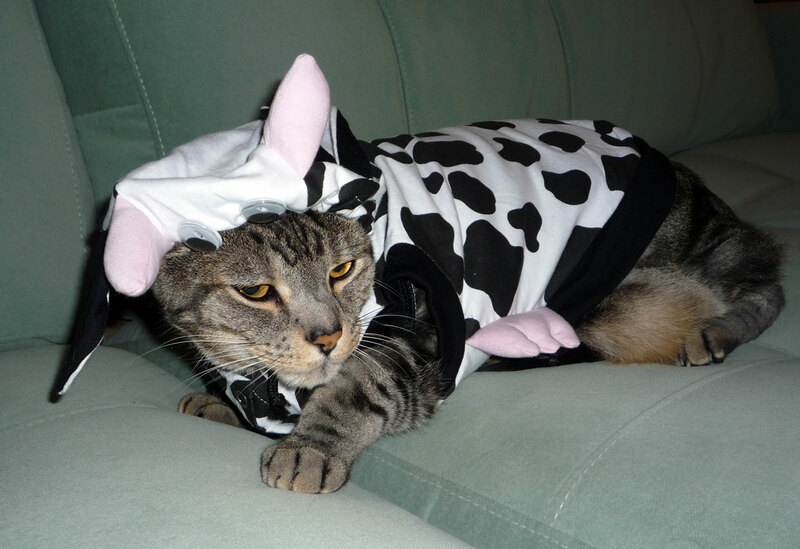 I make a better cow! Well, I have a crushed velvet jacket. And zebra stripes. And a pimptastic hat! Oh yeah? But I have GOOGLY EYES. You're just plain googly. Me? Googly? Noooo. Boogery, maybe. Hehe, but not googly! OK, fine. We're even... and both REALLY, really cute! Pimp and Moo wanted to dress up a little early for Halloween so they could make it for Two Cats Tuesday. I told them it was OK (I mean, really, who am I to argue if they want to be this cute?!). I hope you enjoyed their costumes! Happy Howloween and Meowloween everyone! This is funny! And very imaginative! Hats off to you! LMAO! 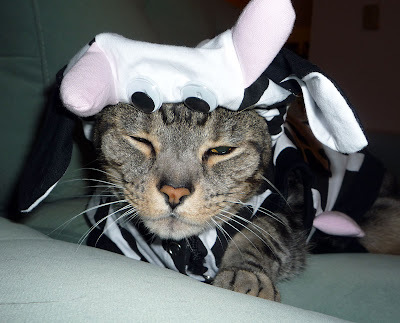 tho I'm not sure Pimp is happy to be a cow! lol - but he sure is a cute cow! And Moo looks awesome as a pimp! Those are cool outfits! I especially love the pimp outfit. Pimp you are too cute taking about having those silly udders. And Moo you do look great in your purple pimp outfit. Cheers to both of you. Take care and have a fun week. 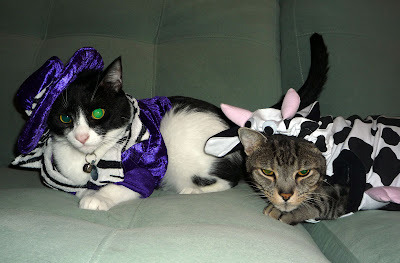 Pimp and Moo look great in their costumes!! Very, very cute!!!! That is fantastic! Moo as Pimp and Pimp as Moo!! Very clever. But how are you going to top it. They look like they switched outfits when you weren't looking... MOL!!! That's pretty funny. But it don't surprise me coming from you! Silly you are. Love it. What cracked me up the most was Moo's costume, dressed up as a pimp. I love the purple pimp hat. Don't mess with this pimp! Cute, Cute, Cute!!! I'm so glad they settled their sibling rivalry & agreed they are both just too darn cute! Happy Halloween Pimp & Moo! That was the costume combo I voted for, and I am so happy it won! They simply look awesome! Pimp does not look happy, though. Too bad, he's so cute as a cow! YAY! We thought that was such a cute idea - we love it! They both look so adorable as "each other" (hee hee). Those are perfect costumes! You both looks pawsome my furriends!! 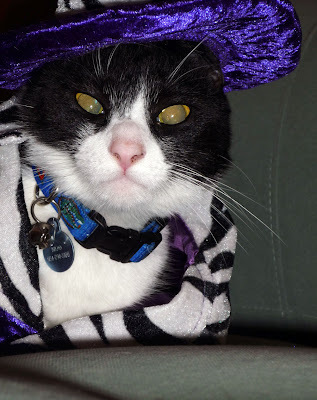 It is so cool how you can switches and it so funny Pimp how you finks you makes better cow MOL, thanks you for my Halloween cookies. great idea Pimp and Moo!! !